We are already in the 21st century, busy with our daily lives. We wake up, go to work, and then we come home. Do we have at least 5 minutes to actually relax? Just 5 minutes to spend with yourself. Think about it. Sometimes life can get so hectic that we just feel like disappearing. I have felt this way many times. Sometimes we feel trapped in a dark long tunnel looking for a way out. As we walk along this long dark tunnel we keep searching for the light. The light at the end of the tunnel; that simple ray of hope that can get us out forever! However, not everyone sees the light at the end of the tunnel. Some of us may think that life is so hard and hectic that there is no light at the end. Sometimes we may see a light at the end of the tunnel, but it may not be the exit. It could trap us in the tunnel forever. Recently I saw a saying on TV that made me re-think the whole ‘light at the end of the tunnel‘ concept. It made me wonder, is the light at the end of the tunnel always a good thing? Does it always show the way out? Or does it simply enhance our problems? There was this priest who was being questioned by the cops. He was helping street children, mostly teenagers, looking after them, giving them a place to sleep. The cop who was questioning him noticed how much he sacrifices for these teenagers and says, "So, you are their light at the end of the tunnel?" The priest replies, "No! The light at the end of the tunnel is the train speeding towards them. I’m just trying to keep them off the tracks." For some reason these words the priest had said made me wonder and reflect. Don’t we often mistake the light of the train for the exit? 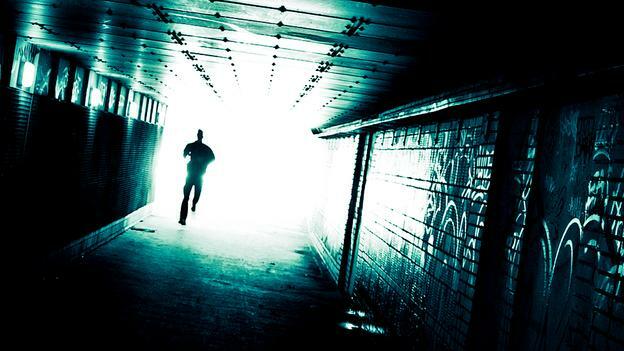 If we believe the light is the way out we may run towards it, but what will actually happen? We would simply get knocked by the speeding train! The light we believed was our way out would simply be the worst disaster that would completely destroy us. I can give you a real life example of this as well. Assume you are in a major financial disaster, and you have no way out. You try your best to get out of this tunnel, but you see no light at the end. Finally, you decide to rob to get out of this mess. You start to see the light at the end and assume that is the way out. You make a robbery and you get cash, the light. But by doing a robbery you are only jumping onto the tracks just at the train passes. You will be caught and arrested, and what you thought was the way out would completely destroy you; and this is the speeding train hitting you hard. But if you decided not to rob and earn harder, make sacrifices the train will pass, and behind it you will actually see the exit you always wanted to see. All you need to do is stay off the tracks and the dangers will pass you by. 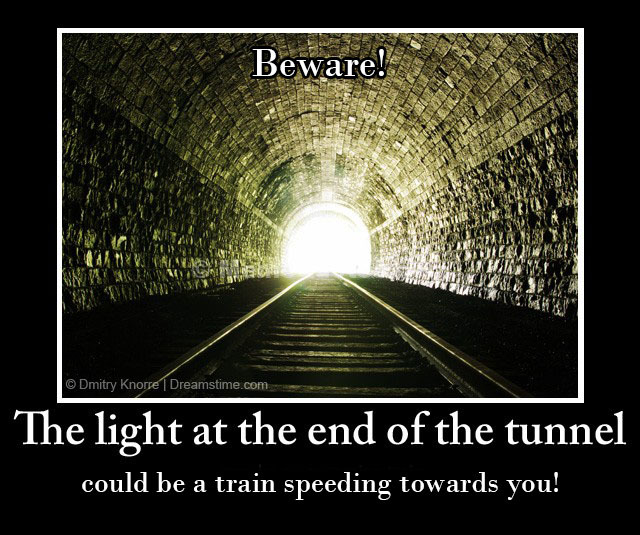 So how exactly do we know if the light at the end of the tunnel is a way out, or is the speeding train? In that case, is not having a light at the end of a tunnel a good thing? Think about it. I believe not having a light at the end of the tunnel is a good thing in a way. You maybe dark and hurt, but there is no danger facing you anytime soon! You may not see an exit, but you will not see a train either. It will keep you going, working until you find that exit. Your path is clear, you are out of danger and you just have to keep going no matter what. The important thing is you stay positive, and do not think there is no light for you, but be happy that there is no train speeding towards you. Then what if you do see the light; an exit, the way out? Think, is that really an exit, or is it the train? How can you figure it out? I believe the best way is to ask God. Believe in God, no matter what. It may be a train or an exit, either way make sure you don’t do anything wrong and jump right into the tracks. Only God can stop the train speeding towards you, and guide you towards the light. Even if the tunnel is pitch black and you don’t see any light, believe in God and he will keep you safe from all dangers. The light at the end of the tunnel cannot always be trusted. Make sure you do what is right and ask God to guide you towards the true light. Do not forget that Jesus sacrificed his life for all of us, and saved us. He has risen from the dead today, and has cleared the darkness from our lives. So even if you are in a tunnel, remember that Jesus was there too. Believe in him, and you will be free! This is my message for all of you today. Wish you all a Blessed and Happy Easter!